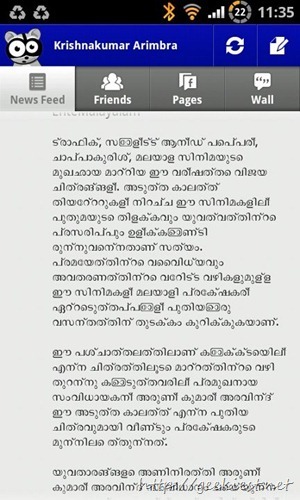 I own a Samsung Galaxy S2, and using apps like Evernote, Facebook, Seesmic which having updates in Indian languages like Hindi, Tamil or Malayalam. The default browser supports Unicode fonts, or the opera mini will also support it (bitmap). The opera mini tip will be the most one you will see when you search. So I installed an app “Font Changer” (Thanks Ashwin), you need a rooted phone to use this. 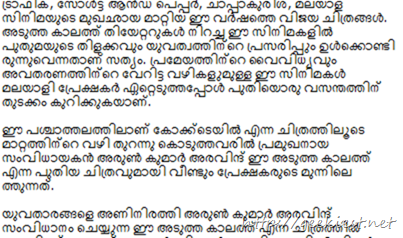 and changed the “DroidSansFallback” font with a Malayalam font (Search on net and find a font , Malayalam, Tamil, Hindi, or any Unicode font you want to use). Application requires a phone reboot to see the changes. This is not that much good as you see in your system, but it is still readable. You can see the difference in the two pictures above. You find a Unicode font for your language from the internet and use that to test it. The app supports rollback to defaults, so you can test it with out much issues. Google Voice now supports 8 More Indian Languages.